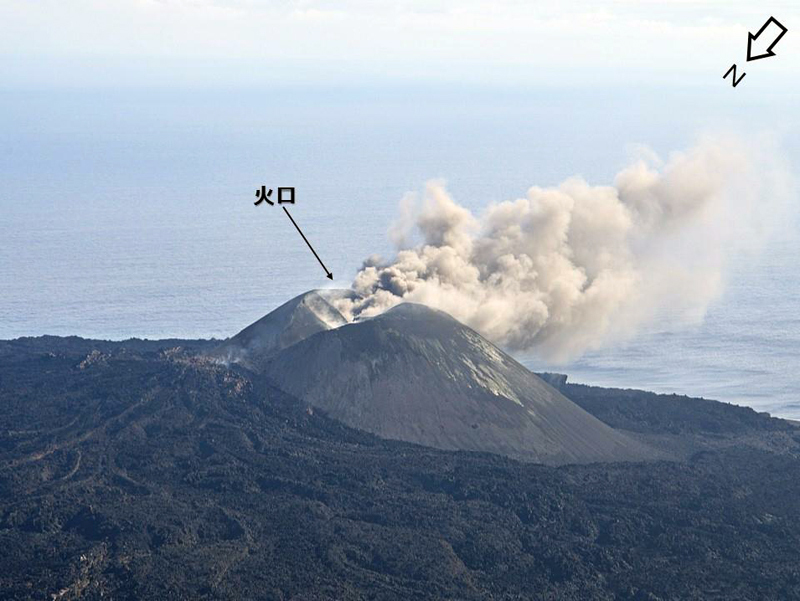 Based on Japan Coast Guard (JCG) observations, JMA reported that a very small eruption at Nishinoshima occurred at 1124 on 12 July, producing a brownish plume that rose from near the crater. During an aerial survey, JCG noted deposits 400 m from the vent. No thermal anomalies were detected. The report warned people to stay at least 500 m away from the crater. Nishinoshima is an active volcano in the Ogasawara Arc, about 1,000 km S of Tokyo, Japan. After 40 years of dormancy, activity increased in November 2013 and has since formed an island. The eruption has continued with subaerial activity that largely consists of lava flows and small gas-and-ash plumes. This report covers November 2017 through July 2018, and summarizes activity noted in reports issued by the Japan Meteorological Agency, and images and footage taken by the Japan Coast Guard (JCG). No eruptive activity at Nishinoshima had been noted since mid-August 2017, when lava was last entering the ocean. Activity recommenced on 12 July and a 200-m-long lava flow was confirmed on 13 July. The lava flow was accompanied by explosive activity that ejected blocks and bombs out to 500 m from the vent, plumes and water discoloration (figures 60, 61, and 62). An aerial survey by the JCG on 30 July showed that activity had ceased and the lava flow had reached 700 m in length, terminating 100 m from the ocean. Figure 60. Aerial photo of Nishinoshima taken on 18 July 2018. The photo shows the active lava flow emanating from the vent along with a gas plume, and water discoloration. A closer view of the lava flow is given in figure 61. The island is approximately 1.9 x 1.9 km in size. Courtesy of the Japan Coast Guard. Figure 61. A view of the active Nishinoshima vent and 200-m-long lava flow on 13 July 2018. The vent is also producing a dilute ash plume from the eastern side of the cone. Courtesy of the Japan Coast Guard. Figure 62. Screenshot from a thermal infrared video of the active Nishinoshima vent taken on 13 July 2018. 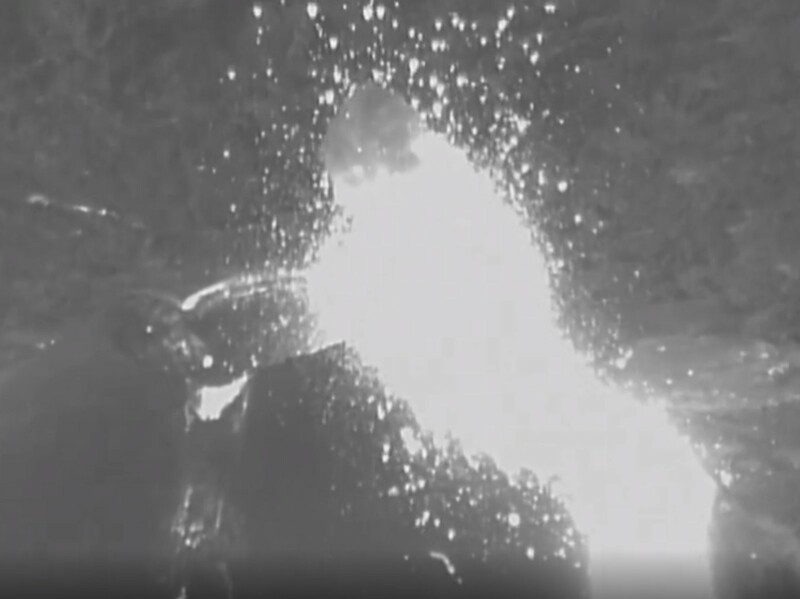 The video shows explosions ejecting incandescent material onto the flanks of the cone and the active lava flow. Courtesy of the Japan Coast Guard. After the July activity, Nishinoshima again entered a phase of quiescence with activity limited to fumaroles around the vent. Himawari-8 satellite observations noted no increased thermal output following the July 2018 eruption. Thermal anomalies detected by satellite-based MODIS instruments were identified by the MODVOLC system from during 12-21 July 2018. Information Contacts: Japan Coast Guard (JCG) Volcano Database, Hydrographic and Oceanographic Department, 3-1-1, Kasumigaseki, Chiyoda-ku, Tokyo 100-8932, Japan (URL: http://www.kaiho.mlit.go.jp/info/kouhou/h29/index.html, http://www1.kaiho.mlit.go.jp/GIJUTSUKOKUSAI/kaiikiDB/kaiyo18-e1.htm); Japan Meteorological Agency (JMA), Otemachi, 1-3-4, Chiyoda-ku Tokyo 100-8122, Japan (URL: http://www.jma.go.jp/jma/indexe.html); Hawai'i Institute of Geophysics and Planetology (HIGP) - MODVOLC Thermal Alerts System, School of Ocean and Earth Science and Technology (SOEST), Univ. of Hawai'i, 2525 Correa Road, Honolulu, HI 96822, USA (URL: http://modis.higp.hawaii.edu/). JMA reported that seismic, thermal, RADAR, and sulfur dioxide data all showed no eruptive activity at Nishinoshima since mid-August 2017. 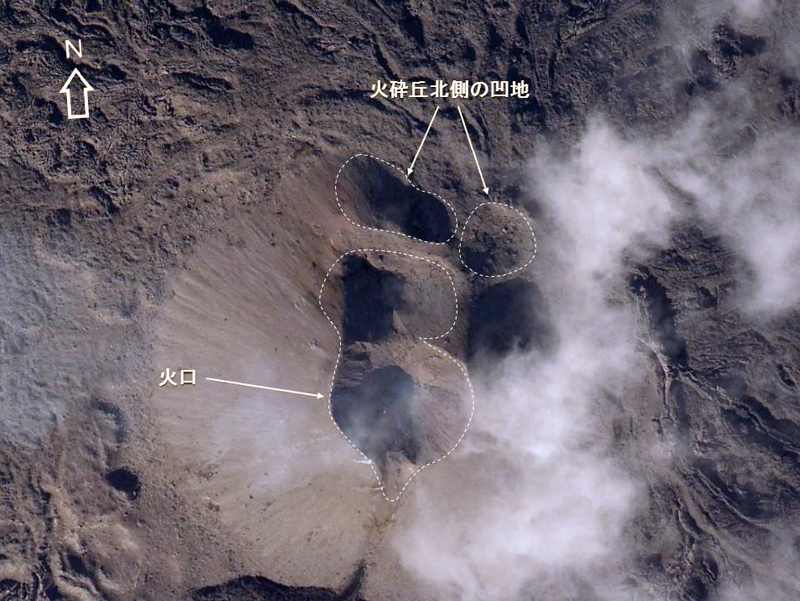 During an overflight on 14 June the Japan Coast Guard noted white fumarolic plumes rising about 20 m from the E side of main cone’s inner wall and from the center of the crater. Ocean water all around the island was discolored, especially in the N-to-NW quadrant where the yellowish brown water extended 200-300 m from the shore. On 20 June the JMA reduced the warning level for the island, specifying hazards were less severe “around the crater” (encompassing areas within 500 m). The Japan Coast Guard reported that visual observations of Nishinoshima from an aircraft during the afternoon of 11 August suggested that the eruption was continuing; a high temperature area at the ocean entry on the W flank and a steam plume indicated flowing lava. Lava in the central crater could not be confirmed; a small fumarolic emission rose from the crater’s edge. Observations on the afternoon of 24 August suggested no lava flowing into the ocean. The Japan Coast Guard reported that visual observations of Nishinoshima from an aircraft during the afternoon of 11 July confirmed that the eruption was ongoing. Emissions from the center of the cone were grayish white and tephra was ejected. The lava flow on the W flank continued to enter the ocean. Based on a pilot observation the Tokyo VAAC reported that on 18 July an ash plume rose to 3 km (10,000 ft) a.s.l. Based on satellite images and pilot observations the Tokyo VAAC reported that on 5 July an ash plume from Nishinoshima drifted E.
Based on satellite images, pilot observations, and information from JMA, the Tokyo VAAC reported that during 30 June-2 July ash plumes from Nishinoshima rose 1.5-3 km (5,000-10,000 ft) a.s.l. and drifted W and E.
The Japan Coast Guard reported that during an overflight of Nishinoshima during 1300-1345 on 2 May observers noted frequent (every 40-60 seconds) Strombolian explosions at a new pyroclastic cone in the crater. Ash plumes rose 500 m. Two lava flows originating from the N part of the cone traveled 180 m SW and 170 m W, and entered the ocean. The island continued to grow and was estimated to be 2 km E to W and about 1.9 km N to S, with an area of 2.75 square kilometers (it was 2.68 square kilometers on 15 September 2016). Satellite images of Nishinoshima acquired on 19 April and processed by NASA's Earth Observatory showed an area of hot lava in the crater. 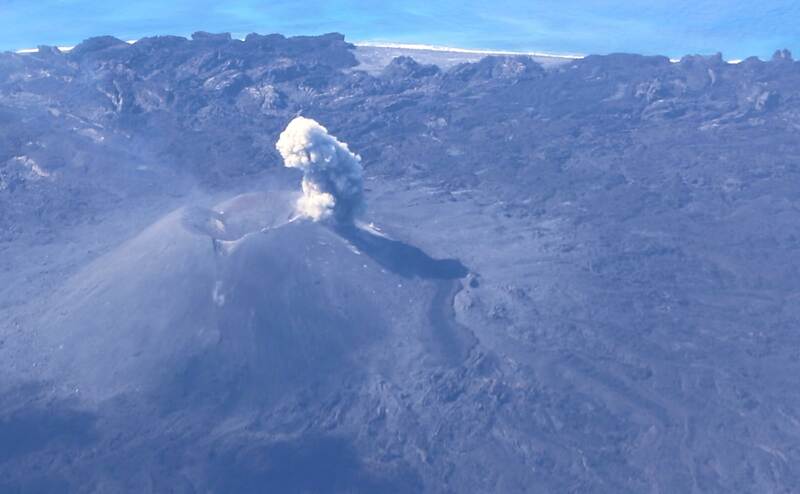 According to a news article, observers aboard a plane passing the volcano on 21 April noted intense activity in the crater. Bombs were ejected as high as 100 m above the crater and incandescent rocks rolled down the flanks, reaching the sea. The report noted brown plumes rising from the crater and lava effusing from an area near the top of the vent. JMA reported that no additional activity was observed after the 17 November 2015 eruption at Nishinoshima, which ejected bombs a few meters in diameter as far as 1 km from the vent, suggesting the eruption had stopped sometime in late November. Gas emissions decreased in June 2016. High-temperature areas around the crater continued to be detected. 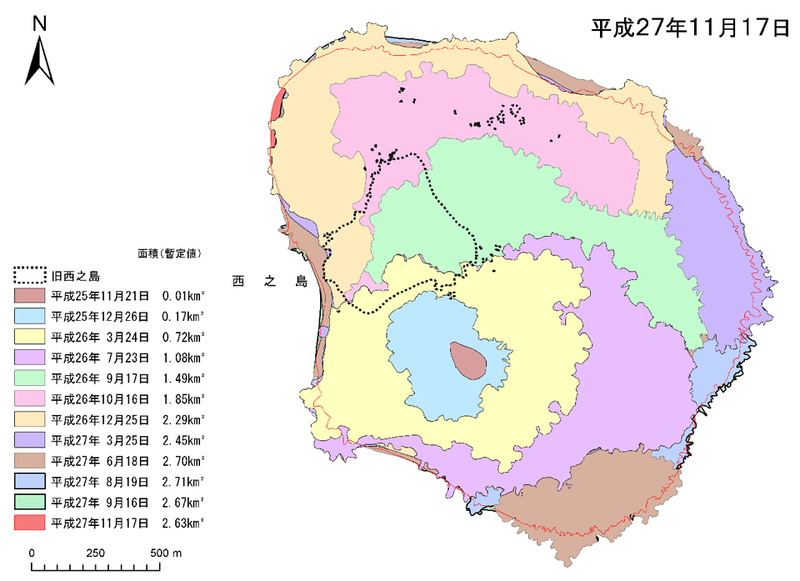 JMA reduced the warning statement for the island, specifying hazards were less severe “around the crater” (encompassing areas within 500 m), rather than more broadly “near the crater”. According to a news article from 22 November, recent footage (from the previous week) of Nishinoshima showed that the eruption was ongoing with explosion from the central crater and lava flows. The new island was 1.9 km E to W, 1.95 km N to S, and 100 m high, based on Coast Guard reports. According to NASA's Earth Observatory, a satellite image of Nishinoshima acquired on 21 June showed a sulfur dioxide-and-steam plume rising from the 2.45-square-kilometer island and drifting NE. Hot spots from lava that had emerged from lava tubes were visible on a lava delta at the SE part of the island. According to news articles, the eruption at Nishinoshima continued at least through 27 February. The Japan Coast Guard noted that the island had grown to about 2.46 square kilometers and the active cone was about 100 m tall. Explosions occurred several times per minute and ash-and-gas plumes rose 1.2 km. Steam plumes rose from areas where lava flows contacted sea water. The Tokyo VAAC reported an ash plume from Nishinoshima that rose to an altitude of about 3 km (10,000 ft) a.s.l. and drifted S on 16 September. The University of Hawaii reported that satellite data from the Moderate Resolution Imaging Spectroradiometer (MODIS) resulted in frequent MODVOLC alerts for Nishinoshima, as recently as 11 September. Tokyo VAAC reported volcanic ash from Nishinoshima at 3 km (10,000 ft) a.s.l. at 2203 on 30 June; the plume extended NE. However, ash was not visible in satellite images. The University of Hawaii reported that Moderate Resolution Imaging Spectroradiometer (MODIS) satellite data detected thermal anomalies and issued MODVOLC alerts during 25 June-13 July with the exceptions of 8, 11, and 12 July. 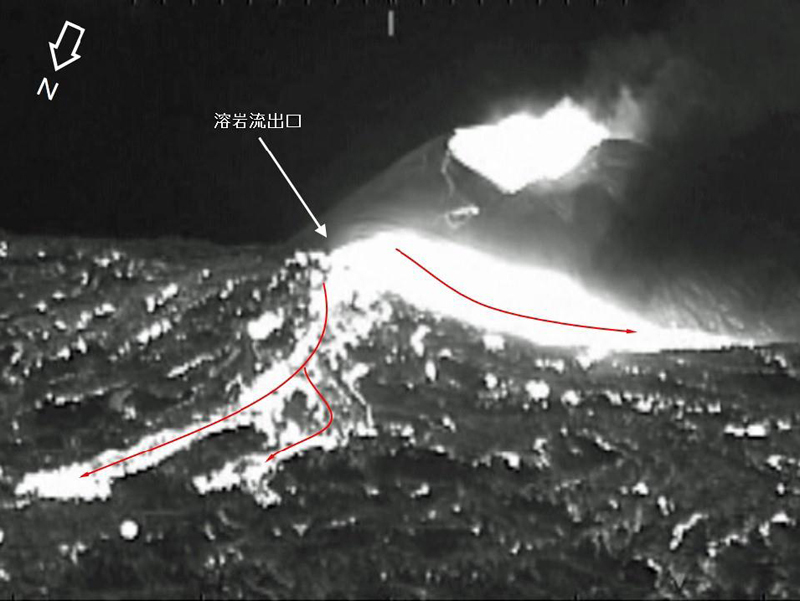 Photographs and video taken from a Japanese Coast Guard helicopter on 11 and 13 June revealed continuing eruptive activity at Nishinoshima. Steaming along the shoreline indicated at least two locations with active, or recently active, lava ocean entries, possibly tube-fed since no surface incandescence was visible. Night video clearly showed an active lava flow and ocean entry being supplied from lava fountaining out of a cinder cone. A significant steam plume was rising from the center of the lava shield from hot tephra deposits over a broad area rather than a crater. However, pulsating tephra ejections and distinctly brown ash plumes were rising from two smaller craters. An incandescent lava lake was visible in one of the small craters on both days. 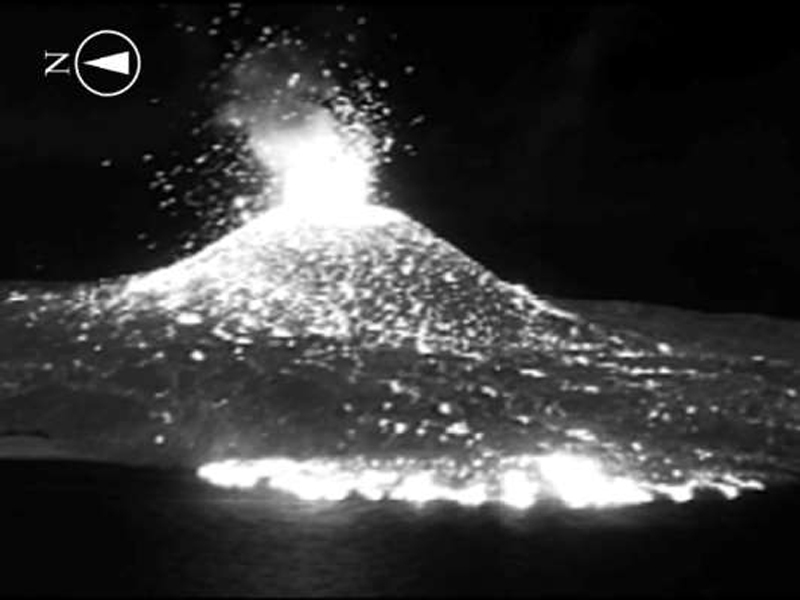 Similar Coast Guard photos taken on 21 May showed a large ash-bearing plume and Strombolian activity from a larger cinder cone in the center of the island. Minor steaming from two central cinder cones was photographed on 15 April, and incandescent lava could be seen in the crater of one. Based on satellite images, the Tokyo VAAC reported that on 18 April a possible eruption from Nishinoshima produced a plume that rose 2.1 km (7,000 ft) a.s.l. and drifted E.
A photo and video posted by the Japan Coast Guard showed that on 20 January the Niijima portion of Nishino-shima was larger than the original island; the two islands had merged on 24 December 2013. White and brown plumes rose from Niijima and the water to the SW was discolored. Based on satellite analysis, the Tokyo VAAC reported that on 21 January a possible ash plume from Nishino-shima rose 0.9 km (3,000 ft) a.s.l. and drifted E. An image acquired a few hours later showed that ash had dissipated. 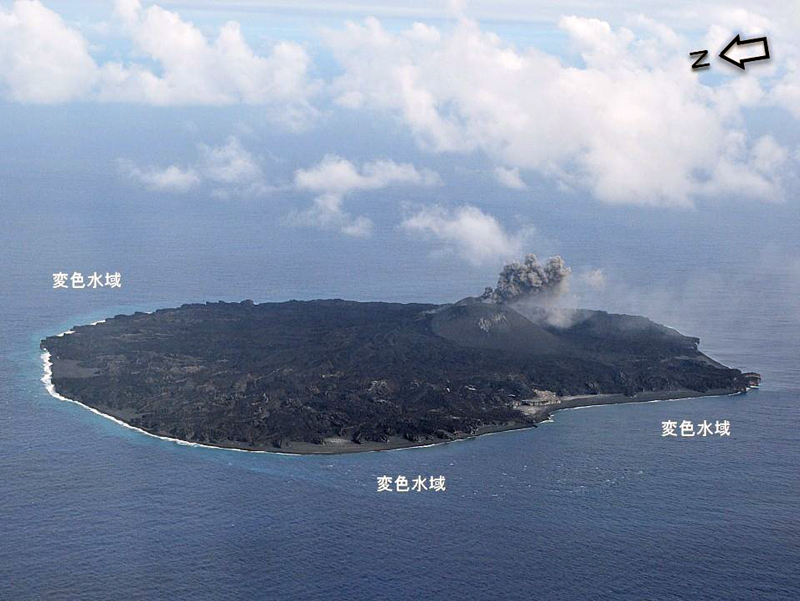 According to a news article, since mid-December lava flows from the newly formed Niijima island expanded NE towards Nishino-shima, and on 24 December the two islands joined. The Niijima area was about 500 m long and 450 m wide. The Japan Coast Guard reported that the eruption at Nishimo-shima, that generated a new island called Niijima continued on 1 December. The crater remained very hot and lava flows continued to expand. The Japanese Coast Guard reported that a Surtseyan eruption 500 m SE from the coast of Nishimo-shima generated a new island called Niijima on 20 November. The island was about 300 x 200 m, and developed a crater 150m wide. Discolored water surrounded the island. 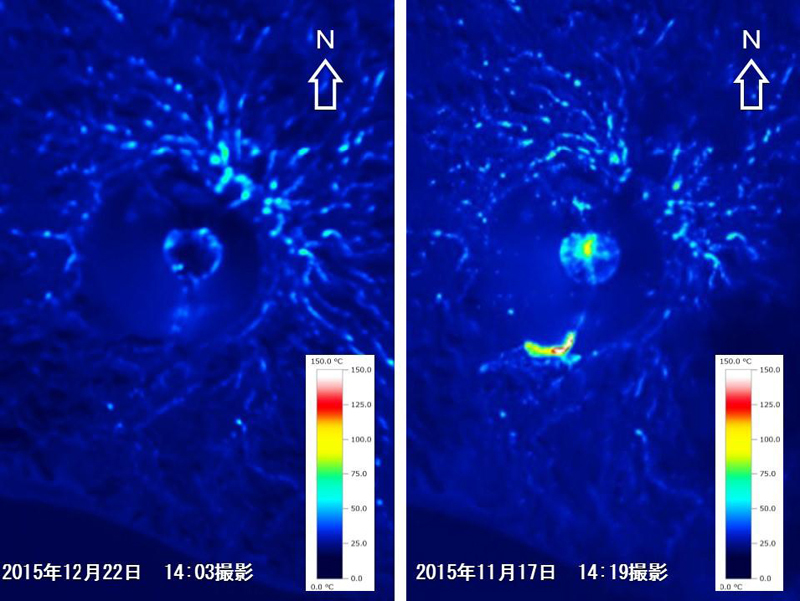 Based on satellite images, as well as accounts from the Japanese Coast Guard and JMA, the Tokyo VAAC reported that a plume rose 600 m. On 22 November the eruption continued and incandescence within the crater was observed. An ash plume rose 900 m and drifted SE. On 24 November lava flows from the crater extended to the coastline of the island, and bombs continued to be ejected. A small submarine volcanic eruption near Nishino-shima Island was reported to have occurred at about 1100 on 30 May 1973. The crew of the fishing boat Daini-Ebisumara reported white smoke reaching a maximum height of 100 m. The smoke was rising from the surface of the sea east of the island at intervals of a few minutes. During an aerial inspection by the Japan Maritime Safety Agency on 31 May, the point of eruption was determined to be about 400 m E of Nishino-shima. A whirlpool was noticed around the site, and yellowish-green sea water and floating pumice were seen about 5 km N of the site. According to Tokiko Tiba, The National Science Museum, Tokyo, the crew of the Tokai-Daigaku-Maru 2 of Tokai University observed two black rocks protruding 1-1.5 m above the sea surface 600 m S of Nishino-shima at 1830 on 1 July 1973. A fan-shaped yellow belt of water about 3 km long was moving at a rate of 3 knots. The submarine volcanic eruption near Nishino-shima is rather small, but the activity is continuing. 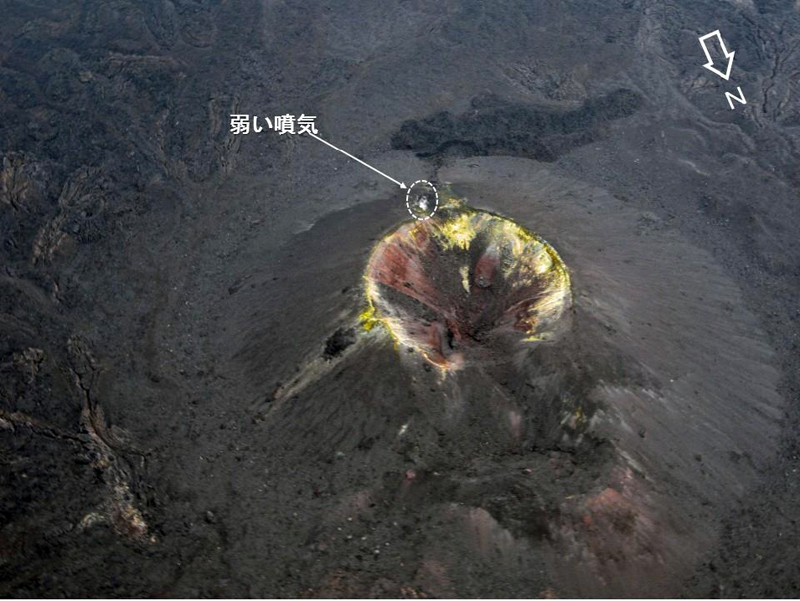 The eruption site is located about 550 m E of Nishino-shima Island. According to aerial observation on 5 July by the Maritime Safety Agency, active bubbling under the sea surface (about 30m across) was seen, and sea water above and around the eruption site was discolored yellow by ashes and pumice. According to an aerial observation by the Asahi Press on 17 July, white volcanic smoke rose 100 m high, and water plumes several meters high were seen at intervals of two to three minutes. About ten reefs in a 30 m area were observed. Card 1678 (18 July 1973)Seismological Division, Japan Meteorological Agency, Tokyo, Japan. Card 1687 (30 July 1973)Seismological Division, Japan Meteorological Agency, Tokyo, Japan. During an aerial observation made by the Japan Maritime Safety Agency and the Japan Meteorological Agency on 14 September 1973 from 1250 to 1400 Japan Standard Time, a new insular volcano was observed to have formed above the sea surface at the submarine eruption site, about 500 m SW of Nishino-shima Island. The new island is a cinder cone about 40 m high and 120 m across, with a 70-m-diameter crater which vigorously and frequently ejects black rock fragments to maximum height of 300 m, accompanied by dense smoke and vapor. Explosions are taking place at intervals of several tens of seconds. White smoke reached a height of 1,500 m, and the water around the eruption site is discolored reddish-brown. The JMA believes that this submarine volcanic activity started in April 1973. Information Contacts: Seismological Division, JMA. The Nishino-shima submarine eruption has formed a chain of cinder cones above the sea surface, which indicates that this activity is a fissure eruption. Eruption review. 11 September: Small rocks were seen above the sea surface with 300-m-high volcanic smoke. 12 September: Successive eruptions with cinders and water plumes. 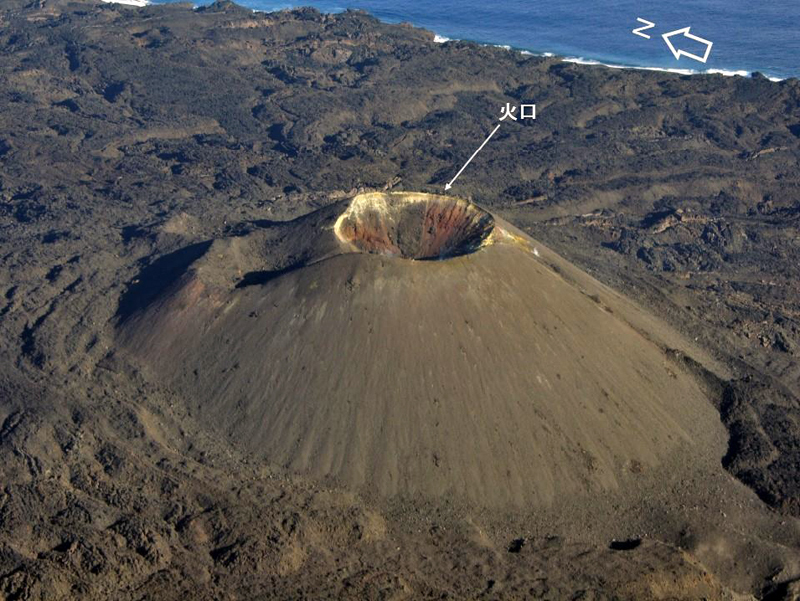 14 September: A new insular volcano appeared above the sea surface, at a point 600 m SE of Nishino-shima. The island was a cinder cone 120 m in diameter with a 70-m-diameter crater. Lava blocks were ejected to a height of 300 m, and volcanic smoke to 1,500 m. 9-10 October: A team of investigators, headed by Joyo Ossaka, Tokyo Institute of Technology, tried to get essential ejecta from the new volcano between 9 and 10 October, but they could not bring the boat to the new island because of rough weather. They collected only 0.3 grams of fallen ash which is now being analyzed by J. Ossaka. Another team will be organized in the near future. Current activity. 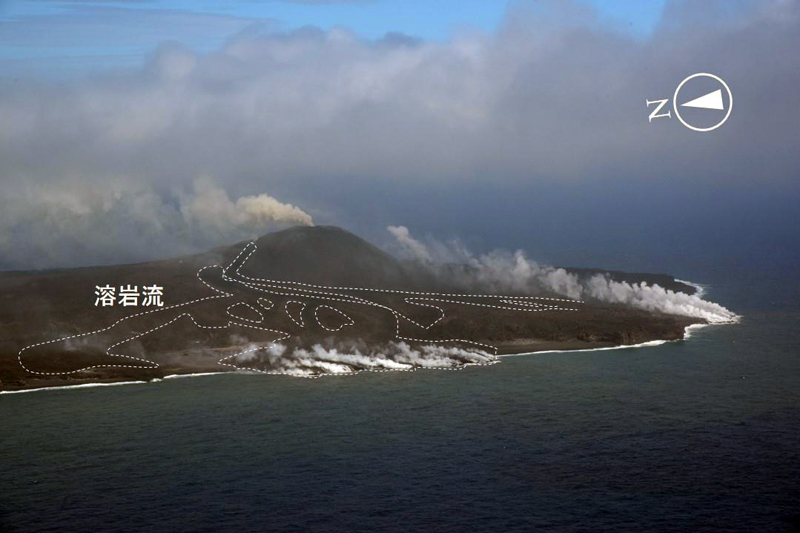 The new Nishino-shima volcano is now composed of a chain of cinder cones running from SW to NE, about 600 m above the sea surface. The most recent eruption is taking place at the tip of this chain. The distance between this recent eruption site and the discolored seawater area detected in April is about 1 km. The primary cones are now being destroyed by waves. The eruption is occurring at intervals of 1-2 minutes, or 5-10 minutes, with water plumes, volcanic blocks and ashes. The maximum height of the volcanic smoke was 500 m and the cinder column (max. 10 m across) reached a height of 300 m. At night, red-hot cinders were seen. The eruption near Nishino-shima is now correctly termed supermarine rather than submarine. The eruptive crater is now located on the sea surface. According to observations made by a research vessel, Tokaidaigaku-II, and airplanes of the Japan Maritime Safety Agency on 11, 12, and 21 December, it was confirmed that the new insular volcano has grown to an island larger than the "old" Nishino-shima. The island was 700 m long and 250 m wide, and about 40 m above sea level. Its eruptive activities are still continuing, ejecting cinders and white smoke to a height of 100 m. Small lava flows out of the craterlet were also observed. This volcano was named "Nishino-shima-Shinto" which means a new Nishino-shima island, on 20 December 1973. It was confirmed by aerial observations on 3 January by the Asahi Press, on 11-14 January by the Nishino-shima Research Group, and on 17 January by Maritime Self Defence Force, that volcanic activities at Nishino-shima-Shinto were continuing as follows: 1) Two cinder cones have been formed at the eastern and the western parts of this smaller volcano. 2) Volcanic activities were limited to the eastern cinder cone. 3) It was observed that erosion by waves has been in progress on this new volcano. According to an aerial observation made on 11 January, red-hot lava was seen in the 10-m-diameter crater of the eastern cinder cone and lave was flowing outside. Small explosions with 50-m-high cinder ejections and 150-m-high white volcanic smoke occurred at intervals of one to two minutes. "According to an aerial observation made on 13 February, rather active smoke emissions were observed originating from the eastern part of the Nishino-shima-Shinto, and eruptive activities seemed to be still continuing. "Special research was carried out from 6-11 March, 1974 by the research vessel, Tokaidaigaku-maru No. 2. According to the interim report by the research group, the external form of this new volcano and the location of the eruptive crater have changed compared with the previous state. Nishino-shima-Shinto is now an insular volcano with five peaks (cinder cones). Red-hot lava fragments were frequently hurled up out of the crater, which had been filled with red-hot lava, located at the eastern part of this island. Lava flows were also observed flowing out onto and/or under the slopes to the shore of the island, where white vapour was rising." 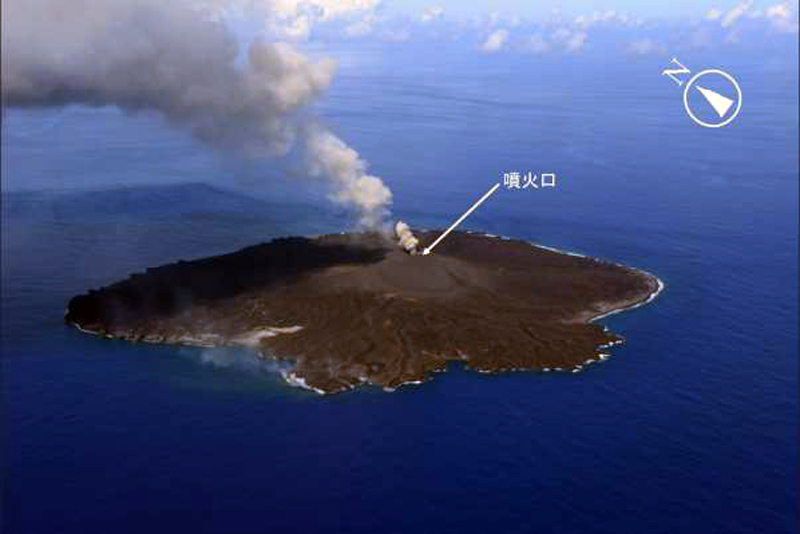 On 1 May 1974, an aircraft of the Maritime Safety Agency confirmed that a large lava flow stretched to the western side of the "new" island volcano, Nishino-shima-Shinto, and that sea water inside the bay surrounded by the "new" and "old" islands was discolored brown. There was no activity on the summit craters, but the "new" island is still developing. Preliminary estimates showed that the "new" island was three times as large as the "old" island, Nishino-shima. On 15 November 1978, discolored water was visible at 27.25°N, 140.88°E, 6.5 km NW of Nishino-shima, the first activity there since the explosions of May 1973-summer 1974. Reference. Ehara, S., Yuhara, K., and Ossaka, J., 1977, Rapid cooling of volcano Nishinoshima-shinto, the Ogasawara Islands: Bulletin of the Volcanological Society of Japan, v. 22, p. 75-84 (SEAN Part I-Observational Results) and p. 123-131 (Part II-Interpretations). Reference. Japan Meteorological Agency, 1988, Bulletin of Volcanic Eruptions, no. 25. Figure 1. Location of Nishinoshima island shown on an annotated topographic map of the Izu-Bonin arc; the insert shows the area of the main map and the larger regional geography. The map highlights the location of Nishinoshima (Nsi). Other features located respectively from N to S are: Os–Oh–shima; Nij–Nii–jima; Myk–Miyake–jima; Mkr–Mikura–jima; Krs–Kurose hole; Hcj–Hachijo–jima; Shc–outh Hachijo caldera; Ags–Aoga–shima; Myn–Myojin knoll; Sms–South Sumisu; Ssc–South Sumisu caldera; Tsm–Torishima; Sfg–Sofugan; G–Getsuyo seamount; Ka–Kayo seamount; S–Suiyo seamount; Kn–Kinyo seamount; D–Doyo seamount; Nsi–Nishinoshima; Kkt–Kaikata seamount; Ktk–Kaitoku seamount; and Kij–Kita Iou-jima. After Kodaira and others (2007). Niijima emerges. 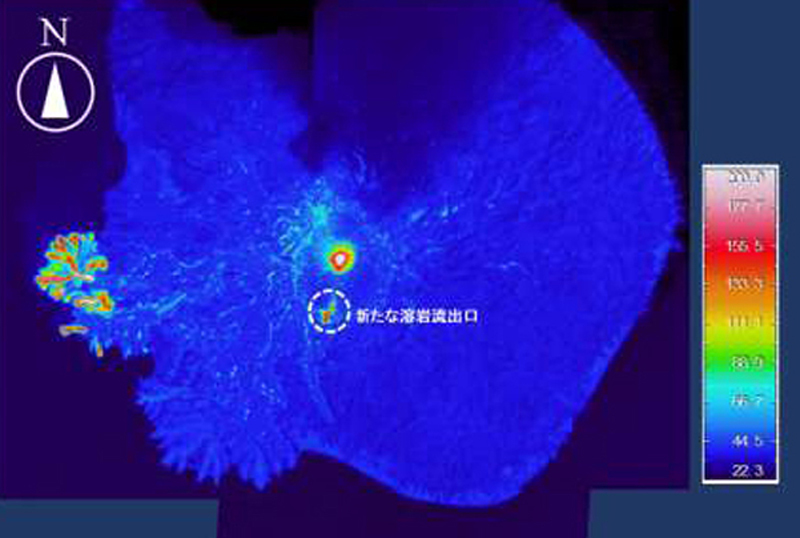 Niijima emerged by 20 November 2013 from the ocean surface at an area ~0.5 km SSE off the coast of Nishinoshima. The latter is a small (700 m2), uninhabited volcanic island that last erupted and expanded in during 1973-74. Additional background information is included at the end of this report. Based on satellite images, the Tokyo Volcanic Ash Advisory Center (VAAC) reported that at 0717 UTC on 20 November 2013 a plume rose 600 m over a new island which emerged ~500 m S of Nishinoshima (figure 2). At 0630 UTC on 22 November, a plume rose 900 m. MODVOLC satellite thermal alerts were measured almost daily from 1635 UTC on 23 November and continued through the latest alert noted at 0120 UTC on 7 April 2014. Figure 2. Niijima produces a plume as it emerges from the ocean to form a new island off the coast of Nishinoshima on 20 November 2013. Courtesy of Kurtenbach (2013); image from the JCG. On 21 November JCG and the Japan Meteorological Agency (JMA) noted that the island formed was by then ~200 m in diameter. A warning of dense black emissions from the eruption was issued by JCG on 20 November, and television footage (Frisk, 2013) showed on 21 November ash and rocks exploding from the crater as steam billowed out of the crater (figure 3). On 24 November, JCG reported lava flows coming from the newly-formed crater. They extended to the coastline of the island, and bombs continued to be ejected. Figure 3. A photograph of Niijima from 21 November 2013 shortly after it emerged from the ocean . Note the large airborne rock erupting from the crater. Courtesy of Kurtenbach (2013); picture provided by JCG. The Advanced Land Imager (ALI) on NASA's Earth Observing-1 (EO-1) satellite captured a natural-color image on 8 December 2013 (figure 4). JMA reported that by early December the area of the new island had grown to 56,000 m2, about three times its initial size, and was 20 to 25 m above sea level. Figure 4. NASA Earth Observatory satellite image acquired on 8 December 2013 from the EO-1 ALI sensor. The discolored water around the island was attributed to material included volcanic minerals, gases, and seafloor sediment stirred up by the ongoing volcanic eruption. The faint white puffs above the center and SW portion of the island are likely steam and other volcanic gases associated with the eruption. Courtesy of NASA Earth Observatory web site. Niijima merges with Nishinoshima. NASA's EO-1 ALI satellite again captured a natural-color image of Nishinoshima and Niijima islands on 24 December 2013 and shows only a narrow channel of water appearing to separate the two (figure 5). The water around the islands continued to be discolored by volcanic minerals and gases, as well as by seafloor sediment stirred up by the ongoing eruption. A faint plume, likely steam and other volcanic gases associated with the eruption, drifted SE. Infrared imagery from the same satellite on the same date showed intense heat from the fresh lava, which continued to build the new island. A strip of isolated, discolored (orange) seawater appeared at the junction of the two islands (figure 6). Figure 5. NASA Earth Observatory satellite image acquired 24 December 2013. Courtesy of NASA Earth Observatory; satellite image by Jesse Allen using EO-1 ALI data from the NASA EO-1 team. Figure 6. An aerial photograph just prior to the merger of the two islands, taken on 24 December 2013, with Niijima on the right and Nishinoshima on the left. Seawater trapped at the junction has been discolored to orange, attributed to the presence of particulate matter and biochemical activity of organisms in the water. Courtesy of the JCG. 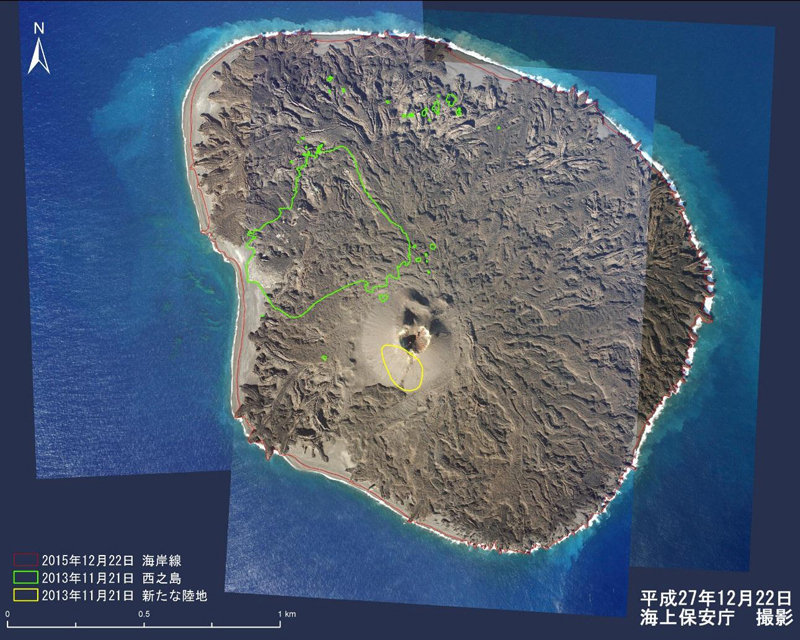 Figure 7 is a drawing by the Japanese Coast Guard (JCG) showing the location of the coastline and the growth of the new island (Niijima) from 20 November 2013 to 26 December 2013. It is striking how much of the island expanded during 13-24 December 2013. Figure 7. Scale drawing of the merged islands showing the changing coastlines as the new island grew. Colored enclosing lines during the current eruption of Nishinoshima as shown for the following dates: 20, 21, 22, 26, and 30 November 2013, and 1, 4, 7, 13, 24, and 26 December 2013 (note legend translated from Japanese for dates and color of mapped shorelines). Image and interpretation courtesy of JCG. According to JCG's aerial observation on 20 January 2014, the new part of Nishinoshima island had an area of 0.3 km2 (750 m E to W, and 600 m N to S) (figure 8). Figure 8. An aerial photograph, looking W, of Nishinoshima island taken on 20 January 2014. The newly merged island, Niijima, on the left, continued to expand NW. White and brown plumes rose from vents on the new land, and the water around the SW portion was discolored. Photo courtesy of the JCG. New images from an overflight on 3 February (figure 9) confirmed that the activity on the former new island continued steadily. Over the past weeks, the vent fed several active lava flow fronts that enlarged the land in more or less all directions. In particular, there are two active flows relatively close to the vent which had been traveling E and formed a small, almost closed bay with green-orange discolored water inside. The previous shorelines for 20 January 2014 (yellow enclosing line) and 21 November 2013 (white enclosing line) are superimposed over the image to show the growth of the island. Figure 9. Aerial photography of the island on 3 February 2014. For comparison, the previous shorelines on 20 January 2014 (yellow enclosing line) and 21 November 2013 (white enclosing line). Image courtesy of JCG. According to Pfeiffer (2014), the island continued growing with lava flows traveling in several directions (figure 10). Its highest peak, formed by the most western of the two active vents, was measured at 66 m. The new addition has more than doubled the size of the island by 16 February. A black-sand beach formed on the NE shore of the old part of the island, as a result of lava fragments washed up by currents and waves. Figure 10. Direction of lava flow from the western side of two active vents is show by vectors superimposed on the image of the island. North is to the top of the photo. The flow arrows were drawn by JCG over an aerial photograph of the island taken 16 February 2014. Courtesy of JCG. In summary, the new addition to Nishinoshima grew ~500 m SSE of the island's S flank, beginning ~20 November 2013, from a depth of ~50 m to a height of ~65 m from an originating time no earlier than 1974, the time of the latest addition to the island. Based on continued emissions and satellite-based thermal alerts, it is apparent as of 13 March 2014 that Niijima was still expanding outward in all directions from the vents, and that Nishinoshima had grown to over three times its original size. Further background. The new island was located in the Volcano Islands, a group of three Japanese active volcanic islands that lie atop the Izo-Bonin-Mariana arc system (Stern and Bloomer, 1992) that stretches S of Japan and N of the Marianas (figure 1). According to the Geological Survey of Japan, Nishinoshima was an emerged submarine volcano in 1974 with a height of ~3,000 m from the surrounding ocean floor and ~30 km wide at its base. For further details on earlier Nishinoshima activity refer to our earlier reports in predecessor publications, CSLP 93-73 (eight cards issued during 1973-1974), SEAN 04:07, and BVE 25. The latter (BVE 25) is a 1985 Smithsonian report called the Bulletin of Volcanic Eruptions noting that aerial observations on 2 December 1985 disclosed pale green water SW from the island. The Geological Survey of Japan reported that Nishinoshima is of andesite to basaltic-andesite composition; Aoki and others (1983) classified the volcano's rocks as high-alkali tholeiite. Nishinoshima is surrounded on all sides by cones, vents, pillars, and parasitic seamounts, and its local bathymetry from surveys in 1911 and 1992 are shown in figure 11. Figure 11. Comparison of bathymetric maps (depths in meters) around Nishinoshima before and after 1973 eruption. The emerged island is shown in green. Depths of 0-100 m are in white, 100-400 m in light blue, 400-700 m in medium blue, and 700-1,000 m in darker blue. The map on the right shows a survey conducted in 1992, after the eruption, based on 1:50,000 basic map of "Nishino-shima" by the Japan Coast Guard (1993). The map on the left shows a survey conducted prior to the eruption, based on mapping in 1911 (Ossaka, 1973). The new island of Niijima first appeared above the sea surface ~500 m SSE of the S coast of Nishinoshima island shown in the 1992 map. Courtesy of the Geological Survey of Japan (2013). From the 1992 bathymetric map seen at right on figure 11, it is apparent that the ocean depth from which Niijima erupted in 2013, was ~50 m. A sketch of the setting showing a cross sectional view (roughly NNW-SSE) appears in figure 12. Figure 12. A sketch depicting an approximately NNW (to the left) to SSE (to the right) cross-section across Nishinoshima (blue indicates sea water) portraying some historical stages of growth. The label "Current Nishinoshima" refers to the pre-existing island prior to and in the early stages of the 2013 eruption. Other labels indicate (a) "Nishinoshima before 1973" (also see 1911 bathymetric map in figure 11), (b) flanking material added to Nishinoshima as it "Emerged during the 1973-74 eruption" (also see 1992 bathymetric map in figure 11), and (c) Niijima "Emerging during ongoing eruption" (red area emerging from the sea early in the 2013 eruption). Original drawing courtesy of The Asahi Shimbun (2013). References. Aoki, H., and Tokai University Research Group for Marine Volcano, 1983, Petrochemistry of the Nishinoshima Islands, La mer, v. 22, pp. 248-256. Earth of Fire: Actualité volcanique, Article de fond sur étude de volcan, tectonique, récits et photos de voyage [Volcano News, Feature Article on study of volcanos, tectonics, travel stories and photos], 2013, Evolution of Nishino-shima's eruption, Earth-of-Fire web site (URL: http://www.earth-of-fire.com/page-8837676.html). Frisk, A., 2013 (21 November), WATCH: Incredible video, photos show new island forming off Japan after volcanic eruption, Global News (URL: http://globalnews.ca/news/981245/watch-incredible-video-photos-show-new-island-forming-off-japan-after-volcanic-eruption/ ). Geological Survey of Japan, 2013, Nishinoshima (URL: https://gbank.gsj.jp/volcano/Quat_Vol/volcano_data/G22.html). Japan Coast Guard, 1993, 1:50,000 basic map of "Nishino-shima." Kodaira, S., Sato, T., Takahashi, N., Miura, S., Tamura, Y., Tatsumi, Y., and Kaneda, Y., 2007, New seismological constraints on growth of continental crust in the Izu-Bonin intra-oceanic arc, Geology, v. 35, no. 11, pp. 1031-1034 (doi: 10.1130/G23901A.1). Kurtenbach, E., 2013 (21 November), Volcano raises new island far south of Japan, AP (Associated Press) (URL: http://news.yahoo.com/volcano-raises-island-far-south-japan-054228644.html). Ossaka, J., 1973, On the submarine eruption of Nishinoshima, Bulletin of the Volcanological Society of Japan, v. 18, no. 2, p. 97-98, 173-174. Pfeiffer, T., 2014 (21 February), Nishinoshima volcano (Izu Islands, Japan): island has doubled in elevation, Volcano Discovery web site (URL: http://www.volcanodiscovery.com/nishino-shima/news/42781/Nishino-Shima-volcano-Izu-Islands-Japan-island-has-doubled-in-elevation.html). Shun, N., 2014, Kaitei chikei (bottom topography), Nishinoshima Kazan (in Japanese), Geological Survey of Japan web site (URL: https://gbank.gsj.jp/volcano/Act_Vol/nishinoshima/page3.html). The Asahi Shimbun, 2013 (22 November), Japan counts on survival of new island to expand territorial waters (URL: https://ajw.asahi.com/article/behind_news/social_affairs/AJ201311220084). Information Contacts: Japan Coast Guard (JCG) (URL: http://www.kaiho.mlit.go.jp/); MODVOLC, Hawai'i Institute of Geophysics and Planetology (HIGP), MODVOLC Thermal Alerts System, School of Ocean and Earth Science and Technology (SOEST), Univ. of Hawai'i, 2525 Correa Road, Honolulu, HI 96822, USA (URL: http://modis.higp.hawaii.edu/); NASA Earth Observatory (URL: http://earthobservatory.nasa.gov); ANN (All Nippon News Network) (URL: https://www.youtube.com/user/ANNnewsCH); VolcanoCafe web site (URL: http://volcanocafe.wordpress.com); Earth of Fire web site (URL: http://www.earth-of-fire.com/); Demis web site (URL: http://www.demis.nl/home/pages/Gallery/examples.htm.). Nishinoshima volcano continued its dramatic above-sea-level growth with lava flows, Strombolian eruptions, discolored water, and ash plumes in 2014. The Hydrographic and Oceanographic Department of the Japan Coast Guard (JCG) and the Japan Maritime Self Defense Force (JMSDF) provided monthly photographic and video documentation and measurements of the growth of the island, which is located approximately 940 km S of Tokyo along the Izu-Bonin trench. 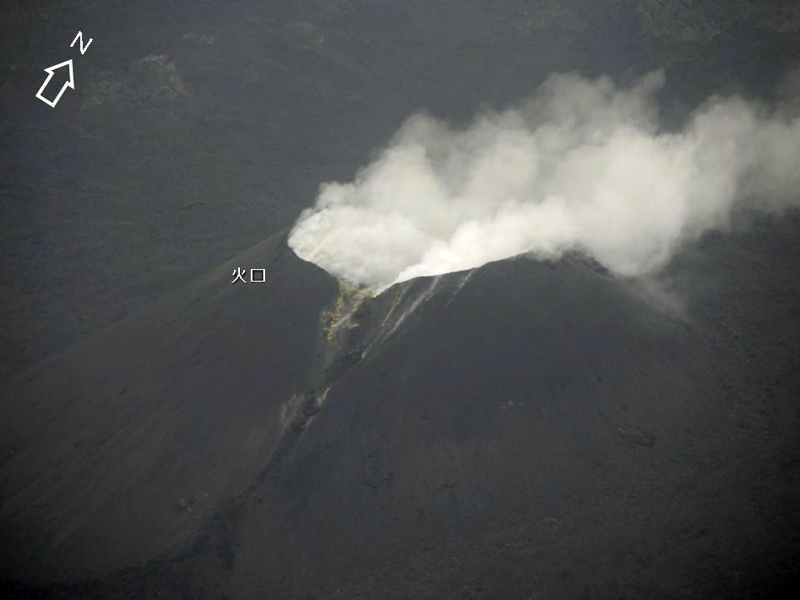 The Japan Meteorological Agency (JMA) has also provided monthly reports of the eruption. New subaerial activity began on 20 November 2013, almost 40 years after the last recorded island-building event in 1973-74. During the interval between these eruptions, a number of submarine events are suspected based on discolored water and volcanic debris reported, but no lava had breached the ocean surface. The emergence of the volcanic center and its merging with the adjacent island between November 2013 and February 2014 were described in a previous Bulletin (BGVN 38:11). After lava flows from the new vent flowed north and reached the older island in late December 2013, the lava flows continued in all directions away from the central crater (Crater 1) and a second smaller crater (Crater 2) that formed adjacent to crater 1. By early January 2014 many active lava flows from the two craters were simultaneously entering the ocean (figure 13). Figure 13. At least seven steam plumes at Nishinoshima indicating lava reaching the ocean are visible in this 16 January 2014 photograph. Plumes of steam and ash are also visible coming from the two central craters. Courtesy of JMSDF. Based on satellite analysis, Tokyo VAAC reported ash plumes on 21 and 26 January 2014. The 21 January plume rose to 900 m and drifted E. The 26 January plume rose to 1,200 m and drifted NE. Crater 2, a short distance north of Crater 1, first opened on 24 December 2013 and was actively emitting steam by the end of January 2014 (figure 14). 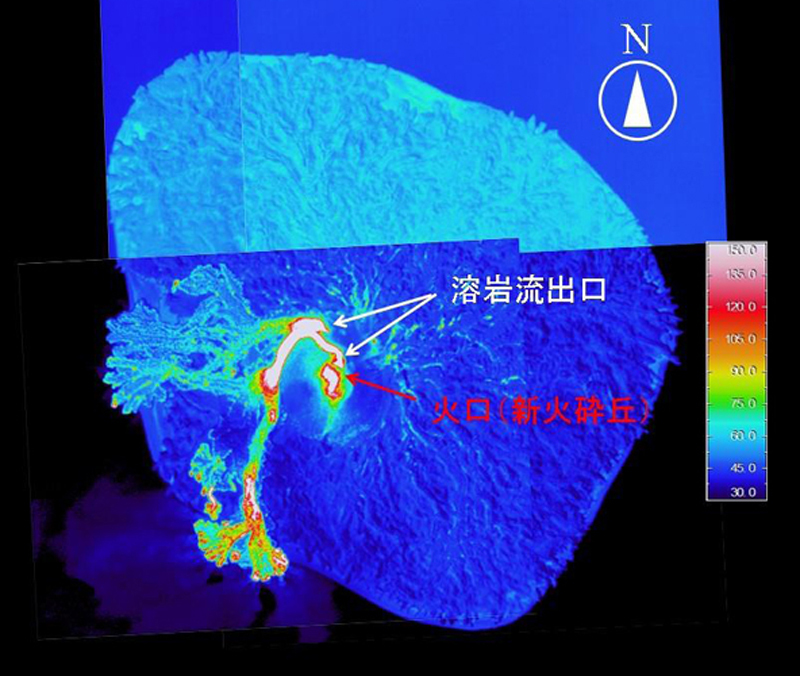 Incandescent material was observed by JMSDF inside Crater 2 on 29 January; light grayish-white plumes intermittently rose to 800 m at intervals of approximately one minute, and ejecta were scattered several tens of meters into the air above the crater. Bluish-white plumes also continuously rose to approximately 500 m above Crater 1. Figure 14. Two active craters on the new volcanic edifice at Nishinoshima are visible in this 29 January 2014 photograph. Note the bluish-white plumes rising from the southern crater (Crater 1) and the white steam plumes issuing from the northern crater (Crater 2). A yellow-orange plume drifts easterly in the water at the base of the active vents. Courtesy of JMSDF and the JMA. Plumes rose as high as 1,500 m in February 2014 according to JCG. 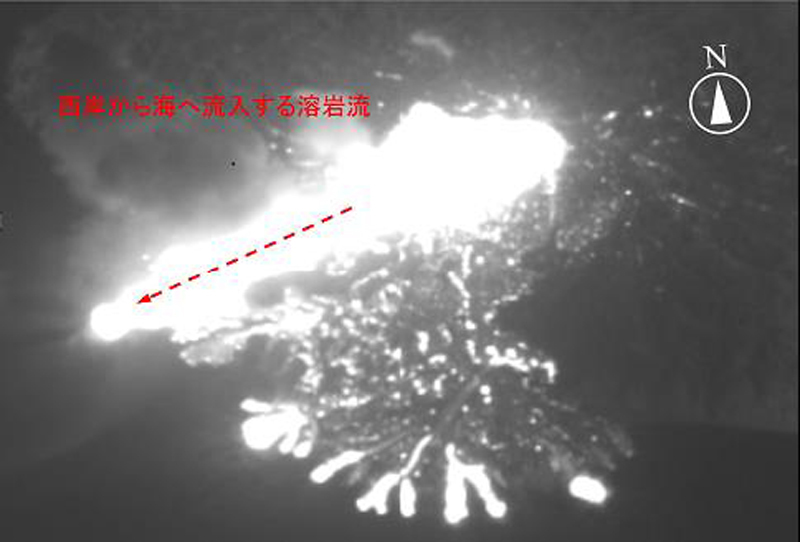 By 11 February, the Japan Coast Guard reported the new land area from lava flows was 920 m E-W and 750 m N-S. Incandescence was photographed at Crater 2 along with a rapidly changing landscape from the active lava flows (figure 15). In just three weeks, the lagoon on the eastern side of the island went from open (figure 14), to closed off by lava flows and volcanic debris (figure 16). Figure 15. Crater 2 (left) at Nishinoshima issues gray and white plumes on 11 February 2014 from an incandescent center, while cooling flows around the cone of Crater 1 (right) emit steam, along with a smaller brown ash plume. Note the lagoon (upper right) has been almost closed off from lava flows since 29 January (figure 14). Courtesy of JCG. Figure 16. Photograph of Nishinoshima on 21 February 2014 showing that the lagoon at the base of the cones is completely cut off by lava flows, and active plumes rising from both craters. Courtesy of JCG. Based on satellite images, Tokyo VAAC reported a plume on 18 April 2015 rising to just over 2,100 m and drifting E. On 15 April, the land area was reported by JCG as 1,190 x 1,000 m, with an elevation of 72 m at the highest point. A new cone (Crater 3) that emerged in between the first two was first observed on 21 May 2015 with incandescent spatter reaching tens of meters into the air (figure 17). Figure 17. Incandescent spatter from the newly formed Crater 3 at Nishinoshima on 21 May 2014, located between craters 1 and 2. Courtesy of JCG. New land area was rapidly forming from lava flows from three active craters and sedimentation of pyroclastic materials around the island in May and June, especially eastward (figure 18). Figure 18. The extensive growth of Nishinoshima island is apparent in this 11 June 2014 photo. Note extensive lava flows to the east (upper left). View looking south. All three craters in the center are active. Courtesy of JMSDF. On 13 June 2014 a fourth crater was seen emitting brown ash plumes (figures 19, 20). The Japan Meteorological Agency (JMA) increased warning levels to a 6 mile radius around the island in case of submarine eruptions on 11 June. Figure 19. New Crater 4 at Nishinoshima emitted a small brown ash plume on 13 June 2014. Much larger steam plumes are rising from the older craters. Steam is also visible in at least two places from multiple lava ocean entry sites. Courtesy of JCG. Figure 20. Closeup of Crater 4 (left) at Nishinoshima emitting a brown ash plume, and craters 2 and 3 (right) emitting steam and ash plumes on 13 June 2014. Courtesy JCG. Tokyo VAAC reported an ash plume rising to 3,000 m and drifting NW on 30 June 2014. JCG observed another new crater (Crater 5) on the east side of the island generating a continuous steam-and-ash plume on 23 July 2014 (figures 21, 22). Figure 21. A new crater (crater 5) on Nishinoshima emits ash and steam on 23 July 2014 on the far E side of the island. The large central crater area (craters 1-3) remained incandescent, and emitted continuous ash plumes. Note the large orange plume of volcanic material in the ocean drifting east and south away from the island. Courtesy of JCG. Figure 22. 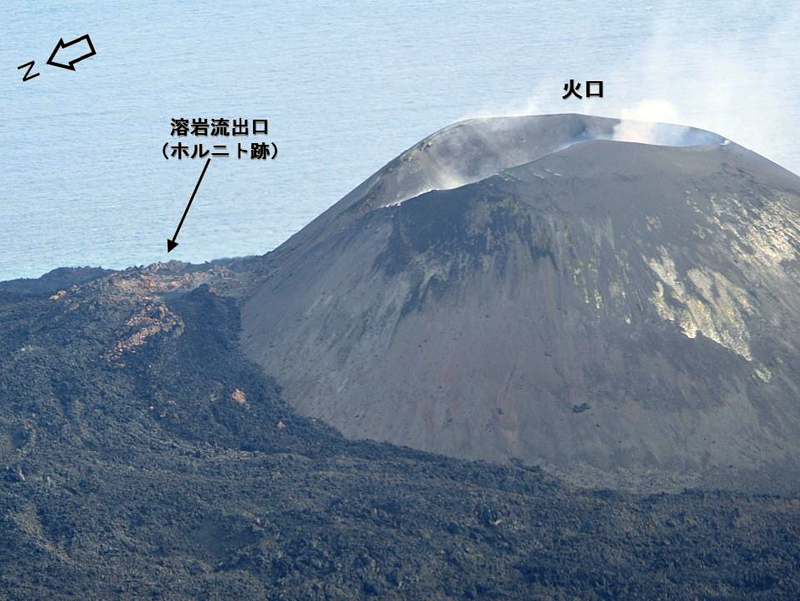 A close up view of Nishinoshima on 23 July 2014 showing Crater 5 emitting ash and steam. Courtesy of JCG. Crater 6 was first observed to the E of the main crater complex on 26 August 2014 (figure 23). Lava flowing from the central crater complex had enlarged Crater 2 and created an oval lava mound with dimensions of 90 x 60 m. The overall dimensions of newly formed land were around 1,550 m E-W and 1,250 m N-S, and the highest elevation was 87 m.
Figure 23. Crater 6 is visible in the distance in this view of Nishinoshima on 26 August 2014, behind the main crater complex. Lava flows have covered over much of the original land to the north (towards the left). Note the large ocean plume of yellow volcanic debris drifting E and S from the island, and smaller yellow and green plume drifting south from the west side. Courtesy of JCG. Tokyo VAAC reported an ash plume that rose to 3,000 m and drifted S on 16 September. Aerial observation conducted by JCG on 17 September 2014 found that most of the lava mound identified on 26 August had become buried in a new pyroclastic cone that had formed to the north of it. A new row of three craters (vent 7) was found to the north of this new cone. Lava was flowing northward from the new row of craters and covering much of the original island (figures 24, 25), and discolored water in hues from brown to light brown was observed around the island. The change in the amount of lava since 26 August is easily recognized (compare figures 23 and 25). Most of the old part of the island was covered by 17 September 2014. Figure 24. A thermal image taken of Nishinoshima on 17 September 2014 reveals the extent of new lava flowing northward from Crater 7, covering the older part of the island. Courtesy of JCG. Figure 25. Photograph of Nishinoshima on 17 September 2014 which reveals the extent of new lava formed since 26 August image (figure 23). The flows are coming from a string of three vents inside Crater 7, located in the region of the original crater. Courtesy of JCG. A detailed series of sketches provided by the Japan Coast Guard shows the growth of the island from 21 November 2013 through 17 September 2014, highlighting the different cones, craters, and lava flows throughout this time (figure 26). Photographs of many of these stages are shown in the previous images. Figure 26. A series of sketches highlighting the growth of Nishinoshima from 21 November 2013 to 17 September 2014. Lava flows are shown in pale yellow and brown. The original pre-eruption island is shown in gray. The images chronical the growth of seven different craters that contributed lava flows and pyroclastic debris to the growing island, and are shown in red. Numbered red arrows identify each crater. Courtesy of JCG. By the middle of October a large new area of lava flows had extended to the north and east well beyond the older part of the island, and lava flows were entering the sea over the entire northeastern quadrant of the island at many locations (figure 27). Strombolian eruptions with ejecta and ash plumes were observed coming from Crater 7 on the pyroclastic cone at the center of the island by JCG on 16 October 2014. The height of the cone was measured at 96 m above sea level. Figure 27. The large area of new lava flows on northeastern side of Nishinoshima on 16 October 2014 are visible in the foreground of this photograph. Note the numerous steam plumes where lava flows are entering the sea. The remnant of the old island is visible as the light brown area on the right side of image. Strombolian eruptions with ash plumes and ejecta are coming from the crater at the center of the pyroclastic cone. Courtesy of JCG. Aerial observations by the National Institute of Advanced Industrial Science and Technology (AIST) on 14 November 2014 found a pyroclastic cone with a single clear conical crater at the summit (Crater 7). At the crater, Strombolian eruptions were observed which produced a grayish-brown plume containing volcanic ash and ejecta. Lava was observed flowing northward from the crater and then splitting into two directions that covered both the NW and NE coasts; white-vapor spouts formed where it entered the ocean. Data from infrasound monitoring on Chichijima Island (134 km E) facilitated by the University of Tokyo's Earthquake Research Institute (ERI) showed an air shock starting on 13 November 2014, indicating high volcanic activity at Nishinoshima along with a series of eruptions. According to Ogasawara Village Office, rumbling was heard on the island and a shock wave was also reported. Very strong thermal anomalies were seen in MODIS data using MODVOLC throughout 2014. Aerial observation conducted by JCG on 25 December revealed periodic eruptions at Crater 7, which was producing gray plumes and emitting ejecta; lava was flowing to the NW and NE to the ocean. The extent of the island was about 1,710 m E-W and 1,830 m N-S, creating an area of around 2.29 km2 (figure 28). Plumes were also seen in aerial observation conducted by JCG on 31 December, and the last remnant of the 1973 island was barely discernable north of the pyroclastic cone (figure 29). Figure 28. View of Nishinoshima on 25 December 2014 looking SW at the central pyroclastic cone with steam plume coming from Crater 7. Note the extent of lava flows to the NE (lower left). The only remnant of the old northern part of the island is the lighter brown area in the center foreground in front of the pyroclastic cone. Courtesy of JCG. Figure 29. Closeup of Nishinoshima on 25 December 2014 showing the remaining fragment of the 1973 island surrounded by new lava flows and volcanic sand beaches. Courtesy of JCG. Japan's Nishinoshima volcano erupted above sea level in November 2013 for the first time in 40 years, and grew dramatically outward from a central pyroclastic cone and other vents with extensive lava flows, Strombolian eruptions, and ash plumes that rose as high as 1.2 km in 2014. The area of the island grew from approximately 0.29 to 2.29 km2 during 2014, reaching an elevation of around 100 m according to the Japan Coast Guard (JCG). Information about Nishinoshima comes primarily from monthly reports provided by the Japan Meteorological Agency (JMA) and photographs taken by the Japan Coast Guard (JCG), which monitors the volcano due to its remote location in the Pacific Ocean, approximately 940 km S of Tokyo along the Izu-Bonin arc. Active growth due to lava flows erupting from vents around the central pyroclastic cone continued through mid-November 2015 when the eruption ended. Observations by the JCG showed that lava flows stopped sometime between visits on 12 and 17 November; the last MODVOLC thermal alert was on 14 November, and MIROVA data showed a drop in energy output a few days later. Ash plumes from explosions were still occurring on 17 November, but no eruptive activity was seen during a 22 December visit. Monthly overflights by the JCG documented the growth of the island, which ended the year with an area of approximately 2.63 km2. The first 2015 aerial observation conducted by the JCG on 21 January revealed that eruptions at Crater 7 (atop the central pyroclastic cone) continued with a gray ash plume rising to 500 m and drifting W. Lava was flowing to the E side of the island and spreading outward like a fan flowing into the sea over a large area (figure 30). Lava was also observed flowing from a vent at the base of the eastern side of the pyroclastic cone, which was emitting blueish-white gas (figure 31). Discolored water along the coastline of the island drifted from E to N and from the W coast near the original island to the S.
Figure 30. Lava spread east like a fan from the central cone on Nishinoshima on 21 January 2015, flowing into the sea and generating steam plumes across a broad area. Brown ash plumes from the cone rose 500 m and drifted W. Courtesy of Japan Coast Guard. Figure 31. Bluish-white gas emitting from a vent at the base of the pyroclastic cone on Nishinoshima on 21 January 2015. Much of the lava that erupted in 2015 came from this vent. Courtesy of Japan Coast Guard. The area of newly formed land continued to expand in February 2015. Aerial observation on 23 February revealed ongoing Strombolian eruptions at Crater 7 that produced brown plumes and emitted lava. White to gray plumes rose as high as 1,200 m. Lava was flowing to the E side of the island and yellowish-green and brown discolored water was observed around the whole coastline except for the southern part (figure 32). The discolored area extended around 1,000 m to the NE with a width of 700 m, and around 1,500 m to the SE with a width of 1,000 m.
Figure 32. View of Nishinoshima volcano on 23 February 2015. Brownish-gray ash plumes rose to 1,200 m from the central crater. Note yellow-green discolored water surrounding the island. Courtesy of Japan Coast Guard. In March, the lava flowed to the N and W from the pyroclastic cone, and ash plumes rose to 1,300 m and drifted generally S. Observations in late April revealed lava flowing from the vent on the NE side of the cone, forming a new lava field to the north of the cone (figure 33). The lava stream then flowed NE through a lava tube to the coast. By May the lava from the vent was flowing SE to the ocean and forming vapor spouts at the entry point. On 20 May the yellowish-green plume in the water was observed 10 km to the SW of the island (figure 34). Bluish-white emissions continued from the vent on the eastern side of the cone in June (figure 35) as lava from the vent flowed SE to the ocean. Figure 33. New lava field flowing N and E from the side vent on the cone of Nishinoshima on 27 April 2015. Courtesy of Japan Coast Guard. Figure 34. The yellowish-green plume from Nishinoshima is visible 10 km SW of the island. Both the ash-and-steam plume from the pyroclastic cone and the vapor spouts from the lava flows entering the sea are also visible in this image from 20 May 2015. The dimensions of the discolored water are 4,000 m from east to west and around 2,000 m from north to south. Courtesy of Japan Coast Guard. Figure 35. Blue-white gas and steam emissions from the vent on the eastern side of Nishinoshima's Crater 7 cone on 18 June 2015 are distinct from the brownish ash plume coming from the crater at the top of the cone. Courtesy of Japan Coast Guard. Fewer explosive eruptions were observed in July 2015. Areal observation on 31 July revealed a new crater in the vent on the north side of Crater 7. Lava flowed N and ENE from the NE slope of the pyroclastic cone in August as well as E and S through a lava tube. Some of the lava continued to reach the coast. The land expanded to the ESE due to lava flows, but coastline recession was observed in several places, especially on the southern side as a result of wave erosion. Aerial observation conducted on 23 August revealed the continued emission of blueish-white to white volcanic gas at the rim of the crater and fumaroles on the W, SE, and NE slope of the pyroclastic cone where white-to-yellow volcanic sublimate was widely distributed (figure 36). Figure 36. White and yellow sublimate from outgassing at Nishinoshima was first observed in August, but continued to expand in this image from 16 September 2015. Lava flows continued to emerge from vents on the NE side of the cone. Courtesy of Japan Coast Guard. Aerial observation on 16 September revealed lava from the NE side of the pyroclastic cone flowing W, NW, and SE. On 13 October the JCG observed small eruptions at Crater 7 occurring every three to five minutes. The lava field on the lower side of the NE slope of the cone had thickened, and lava flowed to the N and W. No lava flow was observed reaching the sea, and no significant changes were observed along the coast of the island. No eruptions at the crater were seen during a brief aerial observation conducted on 29 October, but weak fumes were observed rising around the crater. Yellowish-green discolored water was seen along the coast of the island with a width of around 50 to 200 m.
On 12 November JCG observed intermittent emissions of gray plumes from Crater 7. Lava flowed around 200 m SW from a newly formed outlet on the SW side of the cone. Aerial observation conducted on 17 November by JCG and the Earthquake Research Institute of the University of Tokyo revealed that the lava flow from the SW side of the pyroclastic cone had become slightly thicker and larger. It was also observed that a lava flow from the N side of the cone, which had been active since 17 September 2014, had stopped flowing. Eruptions occurred once or twice an hour from Crater 7 during the 17 November visit, and grayish-brown plumes rose to heights of 300 to 500 m. The eruptions sent volcanic projectiles with diameters of several meters to distances of 500 to 1,000 m from the crater and as far as the ocean on the SW side of the island (figure 37). Figure 37. Eruption plumes observed at Nishinoshima on 17 November 2015. Projectiles were observed to distances of 1,000 m from the crater. Note the dark, fresh lava from the vent in the lower foreground, and wisps of steam rising from many small projectiles around the cone. Courtesy of Japan Coast Guard. No indication of eruptive activity was observed at Crater 7 or other parts of the island during aerial observation on 22 December by the JCG. Very weak white plumes were seen coming from the inner wall of the crater and the southern foot of the pyroclastic cone. No new lava flows were observed. Thermal measurements revealed no high-temperature areas on the island (including the crater or around new lava flows), and showed a remarkable decline in temperature compared with that observed on 17 November. The newly formed land covered around 1,900 m east-west and 1,920 m north-south. Its total area was around 2.62 km2, very similar to the previous measurement in November. Moderate Resolution Imaging Spectroradiometer (MODIS) infrared satellite data revealed the impressive extent of thermal anomalies produced through mid-November 2015. Over 1,000 pixels of thermal anomalies were mapped by the MODVOLC system during 2015. Most days had 3-5-pixel anomalies; some days had as many as ten or more, indicating extensive output of lava. The MIROVA (Middle InfraRed Observation of Volcanic Activity) system's analysis of the 'Log Radiative Power' from MODIS data (figure 38) confirms the high amount of heat energy coming from the volcano during this time, and also corroborates a mid-November cessation of activity. The last MODVOLC thermal anomaly pixel is from 14 November, and the MIROVA data shows an abrupt decline of heat flow a few days later. Figure 38. Log Radiative Power of MIROVA system analysis of MODIS data for Nishinoshima from the year ending 15 August 2016. Note the abrupt decline of energy after 15 November 2015, agreeing with the observations of JCG in December that there was little evidence of active eruption or heat flow at that time. Image courtesy MIROVA. Information Contacts: Japan Meteorological Agency (JMA), Otemachi, 1-3-4, Chiyoda-ku Tokyo 100-8122, Japan (URL: http://www.jma.go.jp/); Japan Coast Guard (JCG), Policy Evaluation and Public Relations Office, 100-8918, 2-1-3 Kasumigaseki, Chiyoda-ku, Tokyo (URL: http://www.kaiho.mlit.go.jp/e/index_e.htm, JCG Nishinoshima Data Site: http://www1.kaiho.mlit.go.jp/GIJUTSUKOKUSAI/kaiikiDB/kaiyo18-e1.htm); Hawai'i Institute of Geophysics and Planetology (HIGP), MODVOLC Thermal Alerts System, School of Ocean and Earth Science and Technology (SOEST), Univ. of Hawai'i, 2525 Correa Road, Honolulu, HI 96822, USA (URL: http://modis.higp.hawaii.edu/); MIROVA, a collaborative project between the Universities of Turin and Florence (Italy) supported by the Centre for Volcanic Risk of the Italian Civil Protection Department (URL: http://www.mirovaweb.it/). Japan's Nishinoshima volcano erupted above sea level in November 2013 for the first time in 40 years. Between then and November 2015 the island grew from 0.29 to 2.63 km2 as a result of numerous lava flows erupting from vents around a central pyroclastic cone (BGVN 41:09). Eruptive activity ended in November 2015, and no additional activity was observed during 2016. A new eruption that included ash emissions and lava flows began in April 2017, and continued until mid-August 2017. Two major lobes of lava emerged from the central crater of the pyroclastic cone and flowed SW and W, expanding the size of the island to about 2.2 km in the E-W dimension and 1.9 km in the N-S dimension, a total area of about 3 km2. Information comes primarily from monthly reports provided by the Japan Meteorological Agency (JMA) and reports and photographs taken by the Japan Coast Guard (JCG), which monitors the volcano due to its remote location in the Pacific Ocean, approximately 940 km S of Tokyo along the Izu-Bonin arc. Satellite thermal data (MODIS) also provides valuable information about the active heat flow at the volcano. Changes during November 2013-October 2015. Nishinoshima grew about twelve times in area between 6 November 2013 and 11 October 2015, after nearly two years of constant eruptive activity (figure 39). JCG presented a map in November 2015 showing the areas added to Nishinoshima between November 2013 and November 2015 (figure 40). 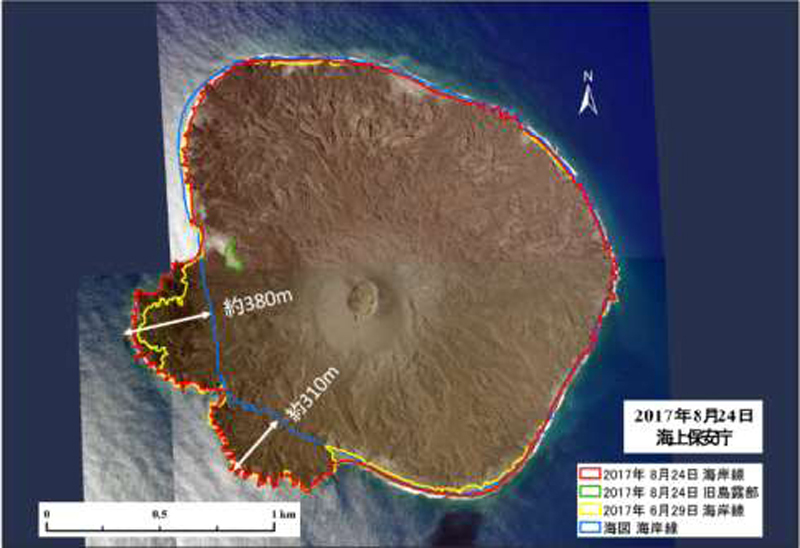 The Ocean Information Division of JMA conducted a seabed topographic survey in a 4-km radius around the island between 22 June and 9 July 2015 that revealed the new submarine topography (figure 41). Figure 39. Nishinoshima grew about twelve times in area between 6 November 2013 and 11 October 2015. The Operational Land Imager (OLI) on Landsat 8 captured these images of the old and new island on those two dates. 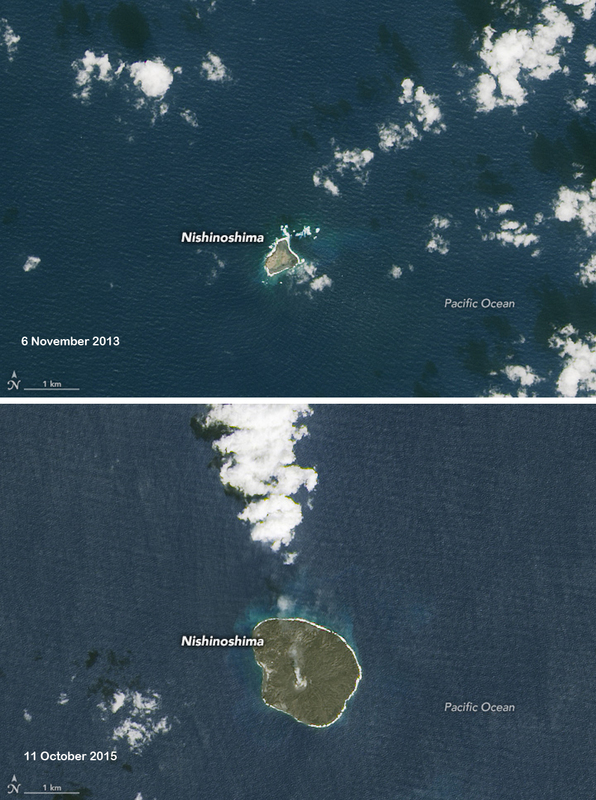 The top image shows the area on 6 November 2013, two weeks before the eruption started. The second image was acquired on 11 October 2015, after nearly two years of constant eruptive activity. In both images, pale areas just offshore likely reveal volcanic gases bubbling up from submerged vents or sediments disturbed by the eruption. Courtesy of NASA Earth Observatory. Figure 40. Changes in the shape and size of Nishinoshima between 21 November 2013 and 17 November 2015. Black dots outline areas above sea level prior to 21 November 2013. The sets of three numbers in the legend represent dates as follows '25' is 2013, '26' is 2014 and '27' is 2015. These numbers are followed by month and day. For example 26..12..25 is 25 December 2014. The total area of the island is shown after each date. The red outline shows the outer edge of land as of 17 November 2015. Courtesy of Japan Coast Guard (Status of volcanic activity at Nishinoshima, 20 November 2015). Figure 41. 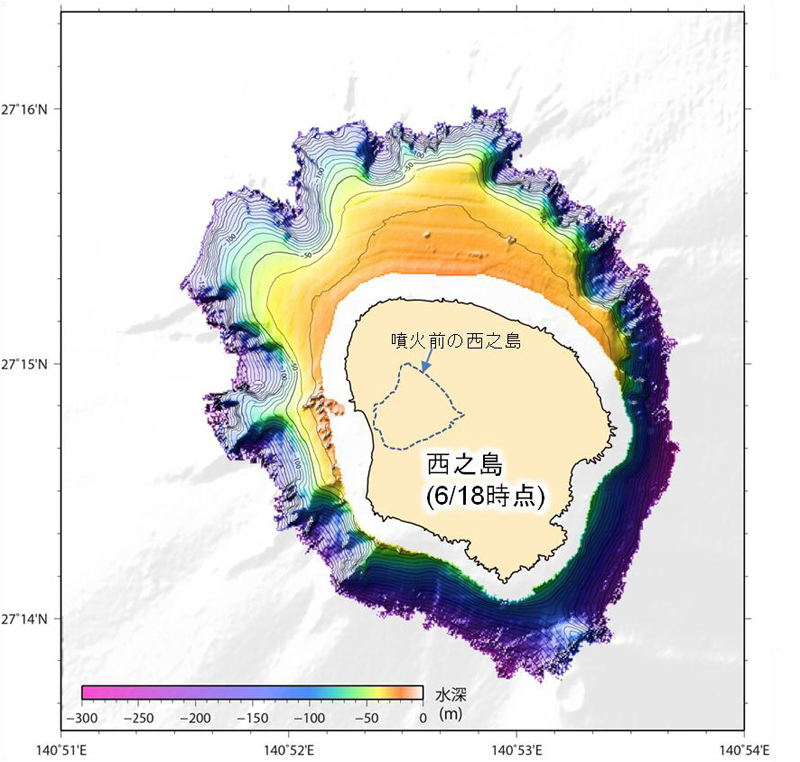 The Ocean Information Division of JMA conducted a seabed bathymetric survey in a 4-km radius around Nishinoshima between 22 June and 9 July 2015 that revealed the new submarine topography after almost two years of eruption. The dashed blue line shows the area above sea level prior to November 2013. Courtesy of Japan Coast Guard (Status of volcanic activity at Nishinoshima, 20 October 2015). Activity during October-December 2015. The JCG visited Nishinoshima on 13 October, 17 November, and 22 December 2015 (BGVN 41:09). Explosions with ash plumes (figures 42 and 43) and active lava flows from a hornito on the flank (figures 44 and 45) were observed on 13 October. On 17 November they observed crater-like depressions on the N flank of the pyroclastic cone (figure 46). Figure 42. Ash explosion from the pyroclastic cone at Nishinoshima on 13 October 2015. Japanese text means "crater". Courtesy of Japan Coast Guard (Status of volcanic activity at Nishinoshima, 16 October 2015). Figure 43. Plumes of discolored water surround Nishinoshima while an explosion emits ash from the pyroclastic cone on 13 October 2015. Japanese text means "discolored water area". Courtesy of Japan Coast Guard (Status of volcanic activity at Nishinoshima, 16 October 2015). Figure 44. Lava flowed from a hornito on the NE flank of the pyroclastic cone (arrow at left, "lava flow outlet") at Nishinoshima on 13 October 2015. Courtesy of Japan Coast Guard (Status of volcanic activity at Nishinoshima, 16 October 2015). Figure 45. Thermal imagery revealed lava flowing N and W from the hornito on the NE side of the pyroclastic cone at Nishinoshima on 13 October 2015. Courtesy of Japan Coast Guard (Status of volcanic activity at Nishinoshima, 16 October 2015). Figure 46. Crater depressions appeared on the N side of the pyroclastic cone at Nishinoshima on 17 November 2015. Courtesy of Japan Coast Guard (Status of volcanic activity at Nishinoshima, 20 November 2015). By the time of their visit on 22 December, there were no further signs of activity from the pyroclastic cone (figure 47), and a comparison of thermal imagery between 17 November and 22 December (figure 48) showed a dramatic decline in heat flow. Aerial photography of the island that day revealed the extent of the new island compared with the pre-November 2013 landmass (figure 49). Figure 47. The pyroclastic cone and summit crater at Nishinoshima were quiet when observed by the JCG on 22 December 2015. Courtesy of Japan Coast Guard (Status of volcanic activity at Nishinoshima, 25 December 2015). Figure 48. A comparison of thermal imagery from 22 December 2015 (left) and 17 November 2015 (right) reveals a decrease in heat flow at Nishinoshima from both the summit crater and the hornito on the SW flank. Courtesy of Japan Coast Guard (Status of volcanic activity at Nishinoshima, 25 December 2015). Figure 49. Composite of aerial photographs of Nishinoshima on 22 December 2015. Green and yellow outlines show areas that were above sea level on 21 November 2013 for comparison. Courtesy of Japan Coast Guard (Status of volcanic activity at Nishinoshima, 25 December 2015). Activity during 2016. The Japan Coast Guard continued with monthly observations during 2016, with visits on 19 January, 3 February, 5 March, 14 April, 20 May, 7 June, 19 July, 18 August, 15 September, and 6 October 2016. Only weak fumarolic activity was observed during the February visit (figure 50). Thermal measurements consistently remained at or below 100°C during the year; plumes of light brown to yellowish-green discolored water generally extended 200-400 m away from the coastline, suggesting continued submarine hydrothermal activity. The discolored water extended 1,000 m off the N coast during the 5 March visit. Dense steam filled the summit crater of the pyroclastic cone on 14 April (figure 51). During their 20 May visit, JCG noted a slight increase in size of the beach areas around the shoreline; this increase continued for several months, likely a result of fresh lava flows breaking down into sand from the wave action. During May and June, small amounts of magmatic gas were visible rising a few tens of meters above the summit crater. Figure 50. Weak fumarolic activity from the S side of the crater rim was the only notable activity observed at Nishinoshima during a visit by JCG on 3 February 2016. Courtesy of Japan Coast Guard (Status of volcanic activity at Nishinoshima, 5 February 2016). Figure 51. Steam emanated from the summit crater of the pyroclastic cone at Nishinoshima during a visit by the Japan Coast Guard on 14 April 2016. Courtesy of Japan Coast Guard (Status of volcanic activity at Nishinoshima, 19 April 2016). On 17 August, JMA cancelled the maritime volcano warning (preventing vessels from approaching within 1.5 km), as a result of the decreased activity. 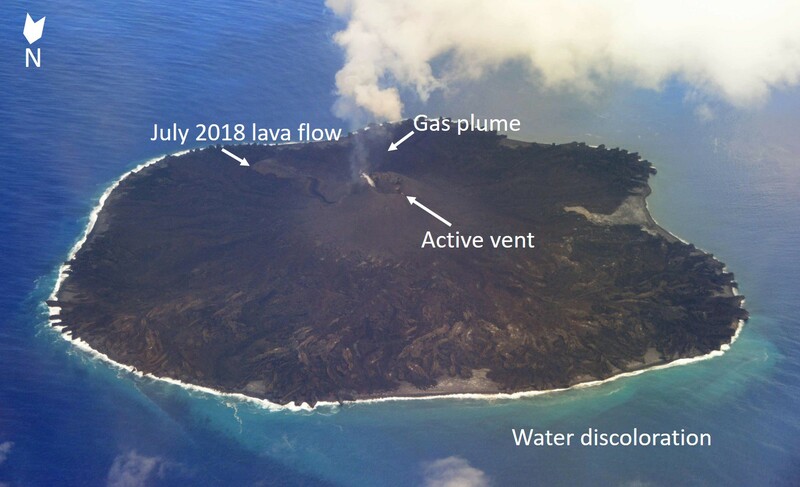 Professor Kenji Nogami of the Tokyo Institute of Volcanic Fluid Research Center noted an increase in the discolored water area, extending about 1,000 m on the S side of the island during the JCG overflight on 15 September. JCG conducted a new submarine survey of the area during 22 October-10 November 2016 to provide data for new maritime charts. No additional reports were issued until a new eruptive episode was observed on 20 April 2017. While the Japan Coast Guard did not observe volcanic activity during 2016, the MIROVA data suggests that low levels of heat flow were intermittent throughout the year, with slight increases during May-June, July-August, and September-October 2016 (figure 52). The heat flow recorded by MIROVA during 2016 was about an order of magnitude less that that during the period with active lava flows in September-November 2015. Figure 52. 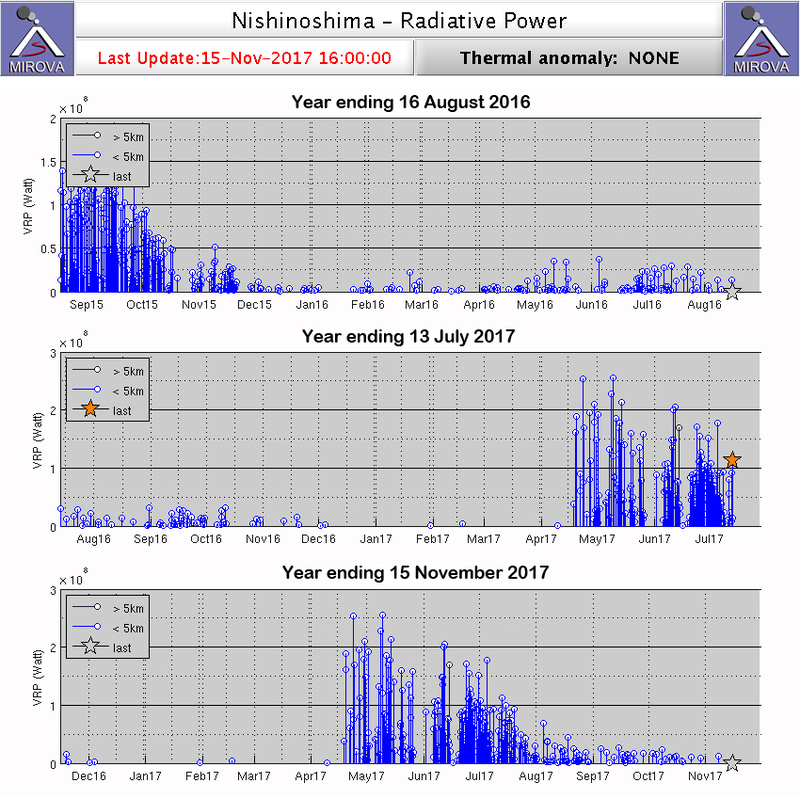 MIROVA Radiative Power thermal anomaly graph for Nishinoshima from 16 August 2015 through 15 November 2017. Data is from the MODIS satellite instrument. Active lava flows were observed by the JCG through mid-November 2015 (top graph). Only minor fumarolic activity was intermittently observed during 2016. Renewed lava flows and Strombolian activity were again observed beginning on 21 April 2017 (bottom graph). Courtesy of MIROVA. Activity during April-October 2017. The JCG observed renewed eruptive activity when they visited Nishinoshima on 20 April 2017. They confirmed the existence of a new lava flow from the summit crater of the pyroclastic cone on 21 April. They also observed a gray ash plume 500 m wide rising 1,000 m above the crater, Strombolian explosions at intervals of tens of seconds, and molten lava within the crater. A new lava flow appeared on the N side of the cone, although it had not yet reached the ocean. By the time of the next overflight on 27 April, JCG confirmed that the lava flow had reach the ocean on the W and SW coast of the island (figure 53), and a new pyroclastic cone had formed within the summit crater. Strong MODVOLC multi-pixel thermal alerts first appeared on 18 April, and persisted with no more than a few day's break until early August 2017. The Tokyo VAAC reported an ash plume on 20 April at 2.4 km altitude drifting W, but it was not identifiable in satellite data. Figure 53. New lava flows (outlined in white) reach the ocean on the W and SW coast of Nishinoshima on 27 April 2017. Ash emissions rose from the summit crater, and steam plumes emerged from the numerous places where the lava entered the sea. Courtesy of Japan Coast Guard (Status of volcanic activity at Nishinoshima, 28 April 2017). Strombolian explosions were observed every 40-60 seconds during an overflight on 2 May 2017. They emerged from the new pyroclastic cone at the center of the summit crater. Ash plumes rose 500 m and drifted SW. Two vents on the N side of the crater produced lava that flowed to the ocean on the SW coast of the island (figure 54). Areas of new lava extended about 170 m W and 180 m SW into the ocean. Continued ash emissions were drifting N from the island on 24 May, and lava continued flowing into the sea along the SW shore. Figure 54. A thermal image of Nishinoshima taken on 2 May 2017 reveals an active lava flow emerging from the N flank of the crater and flowing SW into the ocean. Two vents are identified with the white arrows. The red arrow identifies the pyroclastic cone within the summit crater. The new areas of lava extended about 170 m W and 180 m SW into the ocean. Courtesy of Japan Coast Guard (Status of volcanic activity at Nishinoshima, 10 May 2017). During the next overflight on 6 June, JCG confirmed a new lava flow emerging from the W flank of the pyroclastic cone and flowing to the sea (figure 55). In late June 2017, JMA published a new bathymetric map of Nishinoshima and surrounding waters as of October 2016. JCG noted that explosions continued at 30-second intervals during their 29 June overflight. Ash plumes rose to about 200 m above the crater rim, and lava was entering the sea on the W side of the island (figure 56). The new lava flows now extended into the sea about 330 m to the W and 310 m to the SW (figure 57). Figure 55. A thermal image of lava flowing into the ocean on the W side of Nishinoshima captured during a JCG overflight on 6 June 2017. A new lava flow (red arrow) flows W from the crater to the sea while the lobes of the existing flow continue to extend into the ocean. Courtesy of Japan Coast Guard (Status of volcanic activity at Nishinoshima, 9 June 2017). Figure 56. A thermal image of Nishinoshima taken on 29 June 2017 reveals lava entering the sea on the W side of the island, and a new vent with fresh lava on the S side of the pyroclastic cone (white circle). Courtesy of Japan Coast Guard (Status of volcanic activity at Nishinoshima, 5 July 2017). Figure 57. Two lobes of fresh lava flows extend S and SW from Nishinoshima on 29 June 2017 as ash emissions rise from the central crater. Lava is actively flowing into the sea on the W side of the W lobe, but is no longer active on the SW lobe. Courtesy of Japan Coast Guard (Status of volcanic activity at Nishinoshima, 5 July 2017). The Tokyo VAAC reported multiple ash emissions during June. An eruption generated an ash plume on 8 June that rose to 1.2 km altitude and drifted SW. Emissions were observed in satellite imagery for the next 24 hours before dissipating. Another ash plume on 26 June was reported drifting NE at 3 km altitude. Ash seen on 30 June was reported drifting W at 2.1 km altitude for most of the day before dissipating. The Tokyo VAAC reported a possible eruption on 2 July that sent an E-drifting ash plume to 1.5 km altitude. It was later reported at 3 km altitude before dissipating. Ash and bombs were observed exploding from the central crater during the 11 July 2017 JCG overflight. Lava was also still entering the sea on the W side of the island (figure 58). Figure 58. Strombolian explosions and lava entering the sea were captured in this thermal image taken from the W side of Nishinoshima on 11 July 2017. Courtesy of Japan Coast Guard (Status of volcanic activity at Nishinoshima, 14 July 2017). The JCG visited the island on 11 and 24 August 2017. They did not witness any eruptive activity, but diffuse steam plumes were seen rising from the crater rim. They also noted steam plumes from lava that was still entering the sea on the W side of the island on 11 August, but not during the 24 August flyover. Aerial photos taken that day showed the extent of new land formed since late April (figure 59). Additional flyovers by JCG on 15 September and 7 October confirmed a lack of active lava flows, and only minor steam plumes were reported rising from the crater rim. The last MODVOLC thermal alert appeared on 5 August. The MIROVA thermal anomaly signals that had abruptly reappeared in late April gradually tapered off throughout August, confirming a decrease in the heat flow as the lava flows cooled (figure 52). Figure 59. Composite of aerial photos taken on 24 August 2017 showing the increased landmass at Nishinoshima from the new lava flows that erupted between 18 April and 11 August. The green outline shows the area of the old (pre-Nov 2013) Nishinoshima still visible on 24 August. The blue outline represents the shoreline prior to the eruption of 18 April. The yellow outline shows the shoreline as of 29 June 2017, and the red outline shows the area outline as of 24 August 2017. Courtesy of Japan Coast Guard (Status of volcanic activity at Nishinoshima, 29 August 2017). Information Contacts: Japan Meteorological Agency (JMA), Otemachi, 1-3-4, Chiyoda-ku Tokyo 100-8122, Japan (URL: http://www.jma.go.jp/jma/indexe.html); Japan Coast Guard (JCG), Policy Evaluation and Public Relations Office, 100-8918, 2-1-3 Kasumigaseki, Chiyoda-ku, Tokyo, Telephone, 03-3591-6361 (URL: http://www.kaiho.mlit.go.jp/info/kouhou/h29/index.html); NASA Earth Observatory, EOS Project Science Office, NASA Goddard Space Flight Center, Goddard, Maryland, USA (URL: http://earthobservatory.nasa.gov/); Hawai'i Institute of Geophysics and Planetology (HIGP) - MODVOLC Thermal Alerts System, School of Ocean and Earth Science and Technology (SOEST), Univ. of Hawai'i, 2525 Correa Road, Honolulu, HI 96822, USA (URL: http://modis.higp.hawaii.edu/); MIROVA (Middle InfraRed Observation of Volcanic Activity), a collaborative project between the Universities of Turin and Florence (Italy) supported by the Centre for Volcanic Risk of the Italian Civil Protection Department (URL: http://www.mirovaweb.it/). The small island of Nishinoshima was enlarged when several new islands coalesced during an eruption in 1973-74. Another eruption that began offshore in 2013 completely covered the previous exposed surface and enlarged the island again. Water discoloration has been observed on several occasions since. The island is the summit of a massive submarine volcano that has prominent satellitic peaks to the S, W, and NE. The summit of the southern cone rises to within 214 m of the sea surface 9 km SSE. There is no Deformation History data available for Nishinoshima. There is no Emissions History data available for Nishinoshima. A submarine explosion from Nishino-shima breaches the surface on October 9, 1973. Steam trails behind individual ejected hot blocks at the margin of the plume. 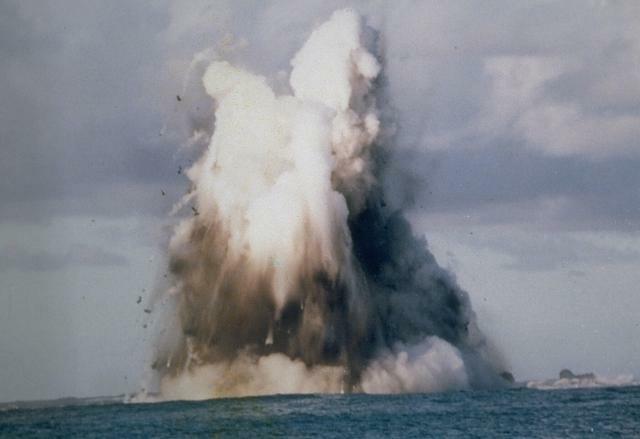 Submarine eruptions began on April 12, 1973. On September 11 a new island was first seen. Lava flows began in September, and three new islands were formed, which joined together during October-November 1973 forming Nishino-shima-shinto. The new island itself was connected to the pre-existing Nishino-shima Island by wave activity after the eruption ended. Photo courtesy of Japan Meteorological Agency, 1973. There are no samples for Nishinoshima in the Smithsonian's NMNH Department of Mineral Sciences Rock and Ore collection. Large Eruptions of Nishinoshima Information about large Quaternary eruptions (VEI >= 4) is cataloged in the Large Magnitude Explosive Volcanic Eruptions (LaMEVE) database of the Volcano Global Risk Identification and Analysis Project (VOGRIPA).